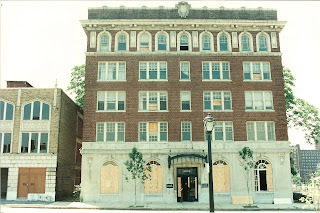 About a hundred feet east of the Beaumont on Washington stood the the Raliegh Residence (also known as the Argonne), a stately 5 story apartment building. I do not know the exact date of construction, but its style, structure and detailing tell me that it dates from the 1920's. It was demolished not long before the Beaumont for a surface parking lot, since apparently someone thought there was a shortage of this on the surrounding blocks! 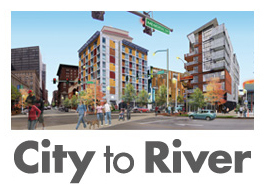 If the Raleigh had been renovated, it would not only have meant the retention of an elegant structure, but would have helped create something that Grand Center desperately needs, that is a critical mass of residential density. Just east of the Raleigh stands a structure that I believe was built in the 20's as a parking garage. 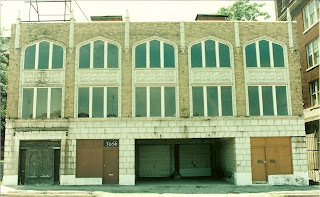 The original facade of the garage was a restrained Gothic revival design executed in cream terra cotta and buff brick. 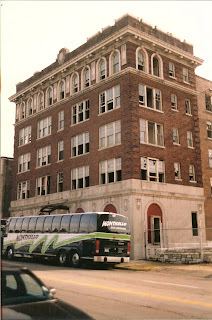 The good news is that in 1998, the garage structure was renovated and became the Sheldon Annex (the beautiful Sheldon Memorial is next door to the east), providing gallery and reception space. 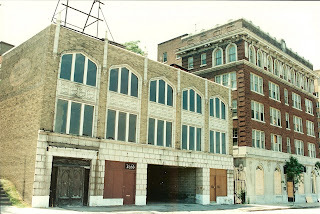 The bad news is that the historic facade which had two tiny storefront spaces flanking the garage entry was hacked off of the building along with the first15-20 feet of the front of the structure in order to provide a large concrete slab in front a new fairly plain brick facade set back off the street. 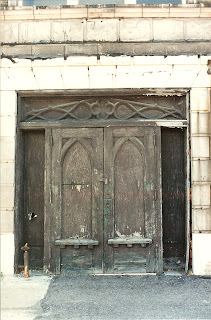 An entrance on the east end of the facade had ornate detailing. 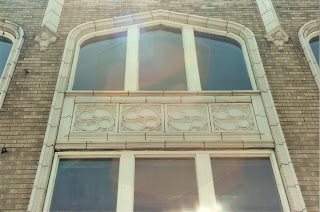 Update: Urban Review STL posted a photo today that shows the terra cotta in the photo above re-installed on the side of Bellon Wrecking's office/pizzeria on Vandeventer. The garage's original front elevation, of course, would have provided a far more elegant counterpoint to the Sheldon than the ho-hum re-clad version. Even with the new musuems, that entire block seems so empty and lifeless compared to its state only eleven years ago.